Christmas in Bavaria is a magical time, especially in the capital of Munich with its holiday markets, festive shopping streets decked out in twinkling lights, and snow-covered Alps in the background. Here’s how to celebrate Christmas in Munich. Wander through the cold, crisp air of Munich’s pedestrian zone after dark to enjoy a view of the city’s most important landmarks, each illuminated by twinkling lights. An evening stroll through the city reveals the impressively lit buildings in the foreground and the fairytale-like mountains in the background, making for a wonderful way to get into the holiday spirit through the New Year. During the holiday season, sip steaming mulled wine (glühwein); find the courage to try Feuerzangenbowle, a mulled wine punch that incorporates a rum-soaked sugarloaf that’s set ablaze; or sample a big piece of lebkuchen, the traditional gingerbread cookie that has been a Christmas staple in southern Germany since the 14th century. For something more substantial, munch on a juicy wurst with mustard, or eat grilled meats off a sword at the medieval Christmas market held at Odeonsplatz. 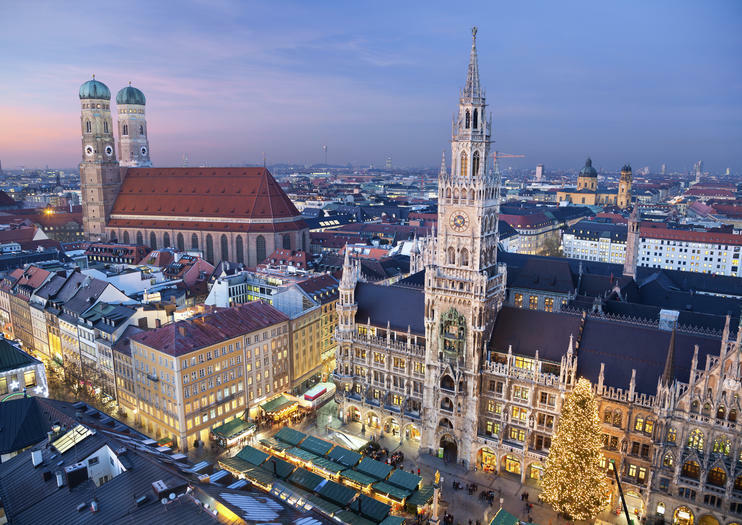 Christkindlmarkt, the largest and oldest of Munich’s Christmas markets, takes over Marienplatz in front of town hall during the month of December until Christmas Eve. Traditional booths at the centuries-old market sell gingerbread, mulled wine, handmade toys, and wooden ornaments beneath a 100-foot (30.5-meter) Christmas tree, adorned with thousands of flickering candles. This may be Munich’s most famous Christmas market, but there are dozens of others.